Posted on March 9, 2010, in Periodtastic and tagged Always, Always Infinity, Blog, Educational, Feminine Hygiene, Fetish, Health, Interests, Maxi Pads, Menstruation, Periods, Sanitary Napkins, Thrush, Women's Health, Yeast Infection. Bookmark the permalink. 27 Comments. wah, the infinity looks so gud! Now I want to try la. Can you bring sum bk for me when u come? They look so comfy. I am afraid that if I try, I will not want to go back to using stuff here or the normal Always…. turn into ‘princess’ lor, lol! How many types are there of infinity? Have you tried them all yet or onli this one? I will trade you stuff here to try that…. xDD makes me so curious now!!!! It doesn’t just “look” good, it “is” good.. lol..
My friend told me when she uses Infinity, she only needs to change like 3-4 times a day, so it cut her changes by like a half! 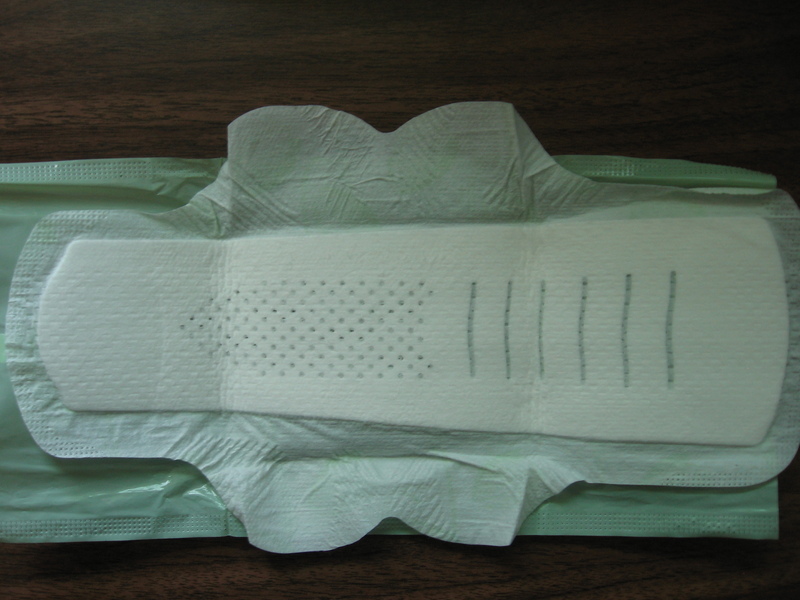 She has a pretty heavy flow too, so obviously the pad holds up very well. Don’t worry about TURNING into a princess, you already are one.. haha! There are 3 types of infinities, just like their normal colour-convention.. Yellow for Regular, Green for Super (called Heavy for Infinity series) and Orange for Overnight. They kept to the colours so it’s pretty easy to figure out. I always thought the Stayfree Overnight Thins were already thin and light…. but seriously, the Infinity ones shocked me at how FEATHERLIGHT it can be! Whoa, the Infinity looks so ENTICING. 🙂 I want! I love the form and the thinness. I wish we had those here. Although it is a Whisper, I would still give it a try. Is the pad cottony? Btw, I don’t know your reader with the yeast infection but I think your post on it is really cool. 😀 Btw, I bet her yeast infection’s gone by now. No kidding eh, the infinity has been the first pad in a LONG time that is a new release. 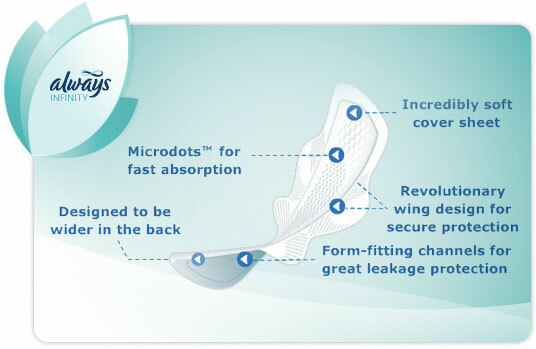 The pads here usually just have a small (and generally useless) change in design or they change the PACKAGE thinking I (and others) can’t tell the difference and call it “new”… The form is simply amazing, never seen anything like it… I think the closest design like that are the pads “Elis Megami” … the MICRODOTS that you see in the middle of the pad is amazing when it comes to distributing flow and keep the top cover dry. And just to tease you a bit more, yes the top-cover is cottony 😆 Here, all the current Always pads have been converted to a cotton-cover, even some, if not all of the pantiliners as well! Speaking of Whisper, I did the comparison of Whisper in PH compared to HK, and the HK ones are considerably better… no wonder you don’t really like Whisper as much (although neither do I in scope of the ‘bigger pictures’). It is nutty-thin and it is so LIGHT… I wish I weighted it before I threw it away >.> now I don’t have any left, blah. I hope the yeast infection is gone for her too 😀 If she found the info interesting and useful in here, then I’m happy for her! Aww, that makes it perfect then. Is it costly though? Here, they have cottony soft or dry max (at least for Modess, they do). I don’t why people would prefer the dry-max to the cottony soft when the dry max top is really not comfy to the touch. 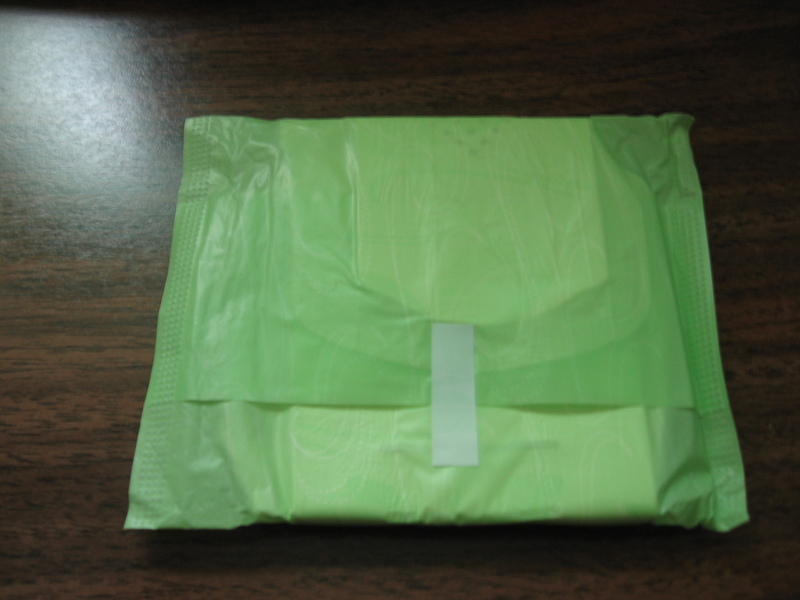 The Kotex that I tried had a very nice cottony feel to it, it was quite soft actually. Too bad things didn’t turn out well. Tsk tsk. It’s about 5.99 (~ php$267.48) for 14 (Overnight), 16 (Heavy), or 18 (Regular) pads in a box standard size. You can get larger sizes of up to 28 (Overnight), 32 (Heavy), or 36 (Regular). And before you ask, yes, pads/tampons are expensive here. I can get TWO packs for the same price in HK >.> and don’t even have to pay tax on top in HK! I’m not a big fan of dry-max, we have dry-max here made by Stayfree, so I’m assuming Stayfree and Modess are the same company, just marketed under a different name like Always and Whisper. I agree the cottony cover is way better, not only that, but I swear that it (cottony) actually absorbs more. The dry-max… well, only makes it “dry” but with a reduced ability to absorb as much. Also, the dry-max texture is scaly, versus something nice and smooth like the non-dry-max ones. Kotex pads have always been nice, soft and smooth – even their older classic ones, so they’ve always been the “leader” when it comes down to comfort throughout their entire line of production. It’s too bad you had a poor experience with them, but try again now that you’re better and let me know 😉 Are you going to try again or not willing to take that risk again? It wasn’t yeast? Oh well, at least I wrote the article anyways, lol. Whatever it was, I’m glad it went away! Hi Alanna, thanks for the input! Always Infinity have definitely come down in price recently. When they first came out, it was a pretty tough sell. 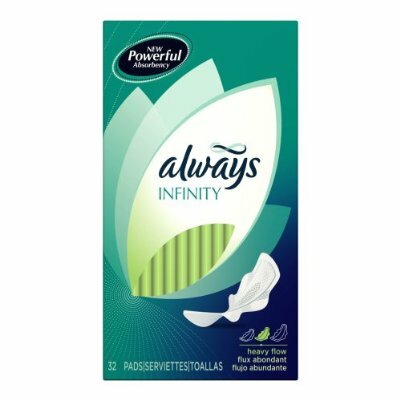 Now that P&G has got more people buying into the Infinity line, they can drop the price since they know they can sell in larger volumes now and not be worried that people aren’t buying into their new product. On good days, I can find Always Infinity regular sized boxes now for about $3.99 and sometimes even with a coupon. Nevertheless, I totally understand that some women are willing to pay a bit more for the comfort, security and peace-of-mind. I know the Infinity is amazing when it comes to staying put, extremely thin/lightweight and really conform well to the many movements of the body – so yes, it’d be great for anyone involved in things like gymnastics, cheerleading or dancing! I wonder if I can reverse the infinity because of the shape and use it on my thongs LOL! Hope it doesn’t leak… Although you’d like that, wouldn’t you? Kekekek. What is wrong with the smell of the pad? I dun understand. The smell of the pad is like a plasticky, musty smell… it’s not rancid, nor is it pleasant though. I’d rather pads either have scented (if it REALLY must) or have a neutral smell. I’m betting it is the smell of the infinicel powder or top-sheet material that emits the smell. 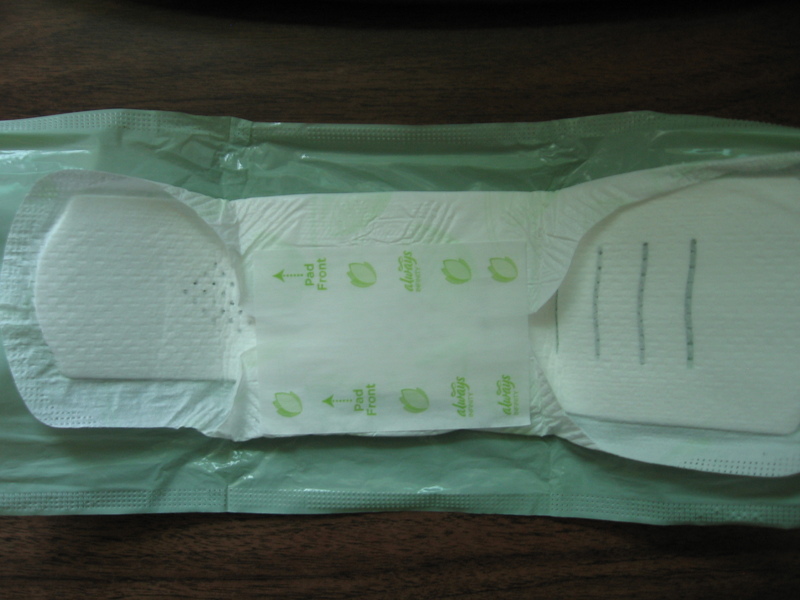 It is noticeable, you don’t even have to stick your nose on it… once you open the pad up by the second fold, you can already smell it. Nothing “wrong” with it, just not something I particularly enjoy. I was about to say that they are expensive but you said it yourself. 🙂 Why are they expensive they, I wonder? Yuck, hate dry max. Yes, the Kotex pad I used were quite soft. Too bad I had such a great experience with them. I will brave through one more period with Kotex and I’ll really let you know. Maysea, everything is expensive in Canada, LOL… I was talking to a Filipino guy when I was gaming and he was telling me the prices of stuff in PH and with the exception of computer equipment, everything is so cheap there, omg! However, I also heard “employees” were not treated well and pay was quite low. I guess you have to be in the senior ranks to be making the big cash there! 😀 They’re expensive because they’re THE pad apparently and it certainly does throw a lot of competition out there in the femcare market to incite other companies to come out with equally absorbent/comfortable pad. Think about all the research and testing they had to do with getting the “infinicel core” to work before they could start manufacturing the pad… that’s big $$$ and of course it is not coming out of their pocket, but out of the pockets of the consumer, LOL. Also, because the infinity allows you to change less often, it saves pads overall. Let’s just say 1 infinity = 2 regular pads (EXAMPLE ONLY), then although you’ve paid a bit more for each infinity pad, it’s cheaper than 2 regular ones. My wife swears by these pads. She was a devoted always ultra super with wings user, but when the infinity came out she threw away all her old always stock. She claims these are the best for her. I can agree that they leak way less for her because shes has had no issues with leaks from gushes of flow such as getting out of bed in the morning. From what she said she always feels dry with these pads. Her old always would start out dry feeling but went downhill after absorbing and especially if she had a gush her pad could not recover like the new infinty pads can. I am glad she is happy with her protection now. A happy wife leads to a happy life! Please keep up the great work on this site and please visit kayo’s site whenever you can. Hey CF, thanks for dropping by! I’ve been going back to lurking Kayo’s again because I got pretty pissed off about all the complaints over the video hosting, haha. Complaints complaints, but perhaps I’ll drop by today and try to find some new material for them! Ultra thin supers seem to be pretty common amongst most of my girls as a de facto for pads and some of them will even mix that with a tampon for security. I’m surprized she’d launch all her old stock out, did you “acquire” them? LOL. The concept and their ability to make something such as the infinity definitely deserve a thumbs up. I really wish they’d do something about the top-cover though. According to the advertisement, it is “soft”, but I think given their technology, it could be better… something akin to the softness of their thick maxis or the Kotex/Stayfree maxi covers instead. Always (what a great pun) glad to hear that your wife has found something that works for her. I LOL’ed @ your “A happy wife leads to a happy life” statement.. I will definitely keep that thought close to me! If only my girl would be as happy as your wife is, lol, that’d be good for me. Will drop into Kayo’s and try to host something tonight when I get home! Having great success against male yeast infections and UTIs! Look into CranVerry+ (Plus) at http://www.cranverry.com 🙂 Let me know how it helps. You understand therefore considerably when it comes to this subject, made me individually imagine it from so many varied angles. Its like men and women aren’t involved except it’s something to accomplish with Lady gaga! Your individual stuffs outstanding. At all times handle it up! Read your review and decided to try it… LOVE IT! If it wasn’t for you, I would’ve never taken the dive to try the product. Thanks so much. Glad you took a chance to try the product! I suggest you look at the new RADIANT line of products if it’s available in your area if you enjoy using the Infinity! Try eating more garlic. Adding a little more garlic to your diet can do wonders if you suffer from yeast infections. Studies have found that garlic has the ability to kill off yeast. This can be used to get rid of yeast infections and may prevent them from reoccurring in the future. One woman I know had mentioned she did not appreciate when a wing would not stick right on her pads, and give her a “Brazilian” at the oddest times! Yogurt will help both men & women against various yeast infections. Note that if your a diabetic, that will make it easier to get a yeast infection, those spores thrive on sugar. Note that douching with various sodas as a form of birth control by women will also encourage yeast. Yes, some women actually believe that is a legitimate form of birth control. My reaction when I first heard about it was to bust up laughing. Pingback: Great and Sneaky Ways To Get Rid Of Vaginal Odor | Cure Vaginal Odor - Fast & Safe !